Newsgur USA: Will your words be honest? Will your words be honest? The pressure on Facebook returns. The silence of its founder, Zuckerberg did nothing but shoot the critics. 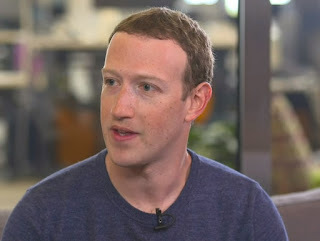 Aware of this, the young man decided to speak and he did it through his network with a post, he admits that mistakes had been made and improvements had to be made.In the letter, Zuckerberg argues that in 2014 changes were made to limit the access of applications to private information. Remember also that in 2015, The Guardian newspaper alerted them that Kogan's work had been transferred to Cambridge Analytica, their employment was banned and both were requested to destroy all the data collected in an improper way and to be certified.Although Zuckerberg does not confirm if there was a misuse of the data, he admits that the breach of trust is a serious error on the part of the platform, one that they can not afford. In turn, announced new restrictions on applications as well as the development of tools for users to control their information. The social network Facebook returns to be news and unfortunately for nothing they are positive. The hubbub of private data leak has put Facebook on the ropes. In seven days, the company has suffered a stock market crash of 50,000 million and has seen how both institutional and social discontent increase on both sides of the Atlantic.In the face of such a crisis of confidence, the founder of the company, Mark Zuckerberg, was forced to break his silence today. To say the young entrepreneur recognizes that they have made a mistake and need to take more measures. Certainly, users place trust in network executives believing that they will protect their information all the time, which has been violated.Doubts about their ability to protect the privacy of users multiply. Brussels, Washington, London and Berlin have demanded official explanations. In the case of Germany, and the own foreign minister Angela Merkel, has requested that the sovereignty of the data be returned to the citizen. On the other hand, in social networks, product to the event has taken force a denunciation movement under the slogan #DeleteFacebook that has had the support of Brian Acton, founder of Whatsapp, whose company bought for 19,000 million Zuckerberg in 2014.Also, different users have filed lawsuits in the US, in response to which, the prosecutors of New York and Massachusetts have decided to operate together. To this is added the investigation opened by the Federal Trade Commission to determine if the privacy of citizens was really transgressed.All this situation has taken its toll on the giant Menlo Park. The amount on Wall Street has gone through one of its worst moments, reaching record accumulated losses of 12%.In a year, Facebook has been immersed in two explosive scandals. The first took place with the presidential elections of 2016, by Russian interference, where Russian agents put into circulation all kinds of hoaxes. And the Facebook platform was its main highway, where propaganda reached 126 million people, almost 40% of the US population. The second turbulent moment emerged last weekend. According to research by The New York Times and The Observer, the social network was targeted for the looting of the private data of 50 million users of Facebook for electoral purposes by the Cambridge Analytica company, linked to the American extreme right. and hired by the Trump campaign team.At the origin of the scandal is a researcher at the University of Cambridge, the Russian-American psychologist Alexander Kogan. Authorized by Facebook, Kogan developed as a scholar a psychological study among users and registered his activity with an application. Although only 270,000 people gave him permission, he obtained gross profiles of 50 million users. That mass of data went to Cambridge Analytica and was supposedly the fuel that served the company to develop voter cards and direct them to electoral publicity. Kogan has stated that he is considered a scapegoat, and Cambridge Analytica denies having used that information in the presidential campaign.